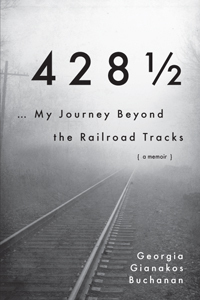 428½ … My Journey Beyond the Railroad Tracks is a memoir of chasing dreams over the span of eight amazing decades. A childhood spent on the “wrong side of the tracks” in Indianapolis, Indiana in the ’30s as the daughter of Greek immigrants — Georgia Buchanan’s story-telling talent shines as she relates — against the rich backdrop of history — her images of the Depression of ’29 — her recollections of WWII — her forays into the downtown movie and stage theaters as a teenager which opens the window to another world. A hard-earned degree in journalism from Butler University fulfills her dream of writing for a newspaper and the Golden Age of Television and Movies becomes her beat in the ’50s. As the Television-Radio-Movie editor of The Indianapolis News — coast-to-coast assignments bring interviews with major stars and world travel beckons. As a staffer at Mutual Broadcasting in Washington DC, she provides us with a front-row seat to the turbulent ’60s — the Nixon-Kennedy campaign — the assassination of President Kennedy and the reign of LBJ as civil rights take front and center. In emotional passages she relates her heart-wrenching struggle in the ’70s to raise a special-needs son — coming to terms with the end of two marriages — and finding purpose in new careers as a writer, artist, fundraiser and board member, as an advocate of the arts, the handicapped, the mentally ill and challenged children. Readers will be riveted to her astonishing story.